Buying a crib for a new baby is a difficult decision and one which requires much thought. There is so much choice available, it can be overwhelming trying to decide what’s best for your baby. This article focuses on convertible cribs, as we think these are the best types for most families. They come in a range of colors and styles, so we have included different styles here to help new parents see what options exist. You’re sure to find the perfect crib for your baby here. This is obviously a priority for parents when shopping for anything for their baby. Ensure the spacing between the bars of the crib are spaced just right, to ensure baby won’t get their limbs or head stuck between the bars. Also look for a crib with an adjustable mattress height, so it can grow with your child. This is important to make sure the baby can’t climb out once they are able to pull themselves up. Also make sure any paint used is safe for little ones and is non-toxic, in case they chew on the sides of the crib. This is crucial for those who don’t want to replace the crib as baby grows. By choosing a 3 in 1 model, you will only have to buy one bed to last your child through the infant and toddler years. Some of the cribs we’ve chosen here are 4 in 1 or even 5 in 1, meaning they can be used into adulthood if you choose to. In terms of comfort, that will likely depend on the mattress you choose to go with the crib. However, the design of the crib can also affect how comfortable and safe the baby feels in it. Convenience is important for new parents who want to maximize time spent with their baby. Look for a bed which is easy to convert between the different styles, or something which has any extra features you may need such as a built-in changing table or some drawers for storage. This mini crib is perfect for those who don’t have a lot of space but still want to have a multi functional cot for their baby. It takes a smaller mattress than a standard crib, but can still be converted to a full-sized twin bed using a conversion kit. The mini crib has all the features you would expect from a full-sized crib, including 3 adjustable heights for the mattress. The cribs weighs in at only 20 pounds, making it ideal for those who struggle to move or build heavy furniture. It comes in several color choices, meaning there is something to suit every nursery. 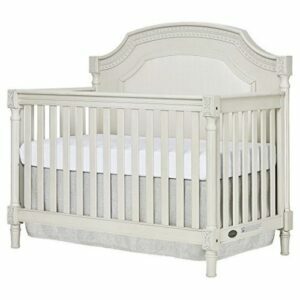 This stunning off white convertible crib would look outstanding in a shabby chic themed nursery. It offers many features you would expect, such as 3 mattress positions, the ability to convert to a toddler bed, as well as a full sized bed with headboard. There is a whole range of beautiful nursery furniture to match this crib, including night stands and dressers. The headboard is upholstered to give a timeless finish, which will look just as good in a little girl’s room as it will in a teenager’s den. 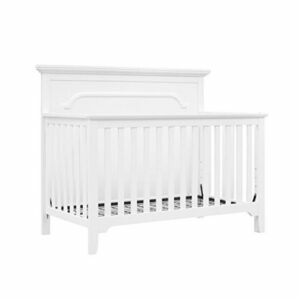 The weathered white crib can be used with an optional guard rail when it is converted to a toddler bed. When it is used as an adult bed, the footboard is optional, giving a large variety of ways to use and style the bed. This infant convertible bed is one of the most versatile on the market. It offers an incredible 7 ways to use: crib, toddler bed, day bed, youth bed with or without footboard and full size bed with or without footboard. With this bed and all the conversion packs, you will never need to buy another bed for your child again. The white nursery crib offers 4 levels for the mattress, making it even more adaptable and flexible. The crib is an excellent price and will give years and years of usage, making it a really great investment for new parents. It comes with all the tools required for assembly, and putting it together is not too difficult. It weight around 45 pounds, which is the perfect balance between being light enough to move and strong enough to be durable. 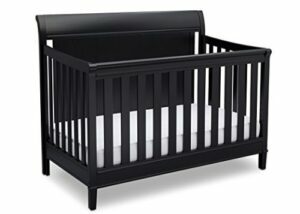 Black is an increasingly popular color choice for a crib. Below, you will find some eye-catching cribs which are sure to add a dramatic look to a baby boy or girl’s nursery. This 4 in 1 convertible crib can be used as a crib, a childrens bed, a daybed and a full-sized bed. This means the same bed can be used from birth for as long as you wish, making it an excellent investment. The mattress can also adjust to 3 different height levels, meaning it’s easy to lift young babies out, but older babies and toddlers won’t be able to climb out alone. Converting the black wood crib is really easy, and full instructions are included. It can be assembled in as little as 30 minutes, and comes with everything required for building it up. The side rails are stationary, making the bed more secure and sturdy for growing babies. Overall, this a is great quality cheap black crib which is easy to use and will last for many years. It would look great in any nursery – it comes in a choice of other colors too. This baby black crib features 3 mattress positions for growing babies, and can be converted to a range of different styles as the child gets older. The parts needed to make the crib into a kids bed and a full-size bed are available separately, but the rail to make it into a daybed is included. There are other pieces of furniture in the range, which means it’s easy to create a beautifully coordinated nursery. The sleigh-style headboard gives it a classic look, which will be enjoyed by children as they get older and use it as a full-sized bed. 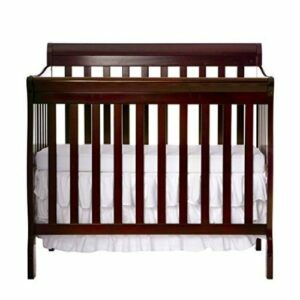 It is an excellent quality, hardwood crib which has been tested to ensure it is safe for babies and young children. 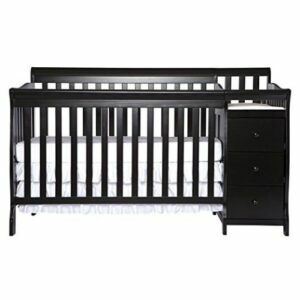 This black crib with drawers is ideal for parents who want to save space in the nursery. It comes with a changing table with drawers and shelves to keep everything you need for a diaper change close to hand. Like many other convertible baby beds, you will need to buy some of the parts separately in order to transform it to the other modes. However, the changing unit can be used as a nightstand when the bed is no longer being used as a baby crib. 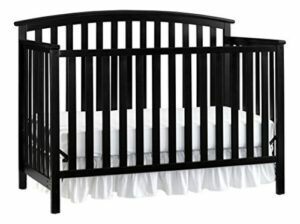 This is one of the most useful black cribs for sale, thanks to the range of functions. Apart from the extra parts for converting the bed, you won’t need to buy another bed for your child for years. The changing table is very useful too, and provides a great storage space, leaving more room for toys and other items in the nursery! The converting crib is reasonably easy to assemble and convert, and features a stationary side rail. The mattress can be adjusted to 4 different positions – ideal for growing babies and children. A gray crib is the perfect choice for a modern nursery. The unique color works well with a range of other colors, and is sure to make the perfect addition to either a boy’s or a girl’s nursery. 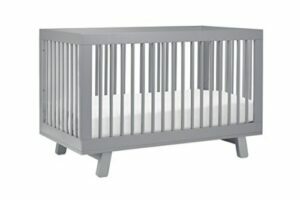 There are loads of gray cribs for sale these days, below you will find 3 of our favorites. This dark gray baby crib comes with a toddler bed conversion pack, meaning it can be used from birth until your child reaches 3 or 4 years of age. The mattress can be raised or lowered to one of 4 different positions, to optimize comfort and practicality for babies as well as parents. The gray convertible infant crib can be used as a daybed for bigger kids, making it excellent value for money. Babyletto is an excellent brand – this crib has been rigorously safety tested to ensure there are no toxic chemicals, and it can support over 135 pounds. The crib is made from solid wood to ensure it is of the finest quality and won’t get damaged easily. This light gray baby crib can be converted into a mini bed or a daybed, and can also be used as a headboard and footboard for a full sized bed when the child gets older. The metal bedframe must be bought additionally in order to convert the crib into a full-sized bed. It also doesn’t come with the toddler bed rail, so it’s probably worth buying the parts together if you plan on converting it as baby grows. The grey convertible crib has the option to be sold with a mattress, which can really take the headache out of shopping for a new arrival. The crib features a fixed side rail for maximum safety and stability. It also boasts a multi-position mattress support meaning it can be fully adjusted depending on baby’s needs. 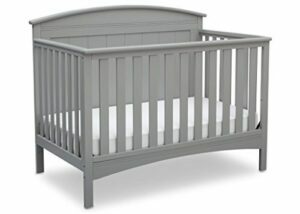 This cheap gray crib would look great in any nursery, for either a boy or a girl. The 4 in 1 crib is part of a range which features all the furniture you will need for a new nursery, including dressers with changing tops. There’s also a matching gray under-bed trundle, providing often-needed extra storage space. 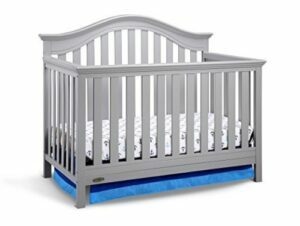 The convertible grey crib includes a daybed rail, but the toddler bed guard and full-size bed conversion kits are both available separately. The crib weighs just under 70 pounds, making it the perfect balance between being sturdy and easy enough to move if needed. There are 3 mattress levels, making it just as safe for newborns as it is for toddlers. 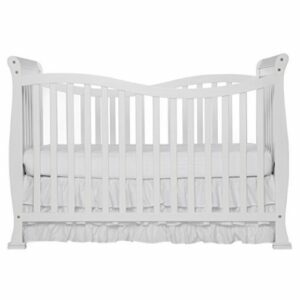 A white crib is a classic piece for a traditional nursery. Below, you will find some timeless styles which are sure to look great in any home. This elegant white convertible infant crib with solid headboard would look stunning in any baby boy or girl’s nursery. It includes a toddler bed conversion kit, and can also be made into a daybed or, if separate accessories are purchased, into a full bed. The infant convertible bed matches a range of DaVinici’s other white baby furniture such as tall dressers and double dressers, perfect for all your storage needs. The sleigh bed crib convertible is perfect for growing with your baby, and will look equally great in a nursery or in a teenager’s bedroom. This whbaby crib is convertible to a toddler bed, a daybed or a full sized bed, by purchasing additional accessory packs. This is one of the best convertible baby cribs with a changing table, as it provides everything you need in one quality piece of furniture. There’s even the option to have the mattress included, or to buy it as a bundle with a beautiful rocking chair to really finish the look of your nursery. 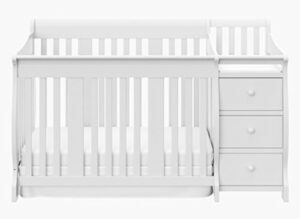 Of the many convertible baby cribs with drawers on the market today, this one stands out as being well-designed and long-lasting. Overall, it would make an excellent investment and you won’t have to think about replacing your child’s bed for many years, and you’ll always have a smart nightstand to go with it, too. 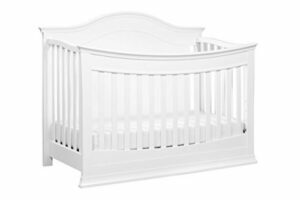 This lovely white 4 in 1 baby crib would make an excellent focal point for any new baby’s nursery. It can easily become a day bed when your baby becomes a toddler, simply by removing the side and lowering the mattress to the bottom position. For those children who aren’t quite ready for a bed without sides, but no longer require the security of a full crib, there’s a guard rail available for sale individually. This will prevent any accidents during the night whilst also allowing your toddler the freedom to get in and out of bed independently. The white baby cot has a beautiful, elegant design which looks just as good in a teenager’s or adult’s bedroom as it does in a newborn’s nursery. There are other items of baby furniture which would really complete the look, including dressers and a handy crib top changing table, to maximize space in the room. The white solid back crib is really easy to assemble, and should take not more than 30 minutes. The instructions are easy to follow, and there are very few parts to the bed, making it easy to determine what goes where!